Okay, objectively speaking, this may be a bad film, but ... it's got "something." It's certainly unique. Although Eyes Behind the Stars was released around the time of Close Encounters of the Third Kind, it seems more inspired by those 1970s Sunn Classics feature documentaries. The ones about UFOs, and ancient astronauts, and the Bermuda triangle. Much of Eyes Behind the Stars is just characters reciting facts about Project Blue Book and various abductions and investigations. An end credit scroll tells us that all the quotes concerning military and investigative officials are factual. The writer/director even touts his membership in UFO investigation societies in the opening credits. Rather than a conventional story arc, the plot is more an attempt to string together some UFO lectures, as our reporter hero interviews a UFO expert, then teams up with him to solve the UFO dilemma. An Air Force officer debates government policy with a Man In Black, going over theories of censorship and the potential of public panic if the truth of UFOs was revealed. It's almost like watching a cheaply made, dramatized, UFO documentary. Its seriousness mirrors The X-Files, although its reporter hero may be likened to a more polished Kolchak. The film was shot in Italy, yet is set in England. All the dialog seems dubbed into English. American actor Martin Balsam is the biggest star, yet his dialog is also dubbed, by an actor with a vaguely Scottish accent. Which is curious, because none of the other "English" characters have British accents of any kind. The aliens are a poor man's Gray. Their look evokes Grays, but not explicitly. The aliens are just full-sized actors in full body suits (thermal underwear?) with blue faceplates (right). So we don't see the aliens' faces. Well, that's one way to save on the budget. In traditional Italian film fashion, when our hero reporter learns he's been betrayed by a woman, he slaps her around. But it's so poorly photographed, we can tell his hands never come close to striking her face. Toward the end, the reporter and UFO expert bring in a psychic to make contact with an abductee lying in a coma. Sure, why not? The ending itself is dark and unexpected. Very nasty and conspiratorial. Yeah, it's a shoddy film, but it's unique, and it has a funky 1970s attitude. I enjoyed it. The abduction scenes are not as scary as in Fire in the Sky, yet Eyes Behind the Stars is spooky at times, if one has the lights turned low, and is in the right frame of mind. I first saw Eyes Behind the Stars on VHS. I later bought this DVD copy. It's full screen, with no special features. And lots of grain and washed-out colors. It looks like this DVD was struck from the VHS, which in turn was struck from an old TV film print. But hey, with new DVD copies selling at a penny a piece on Amazon, you can't very well expect it to be digitally remastered. 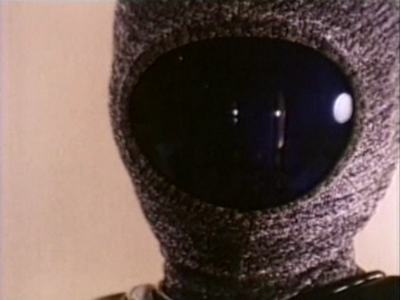 The Italians made some wonderfully trashy-fun sci-fi films in the 1970s. 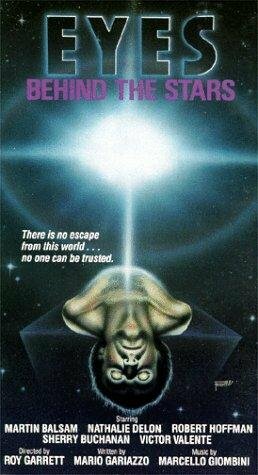 Apart from The Humanoids (my favorite Star Wars ripoff -- better than Star Crash), I especially recommend The Visitor (1979), which combined elements of demonic possession, UFOs, antichrist films, evil children, and Hari Krishna type alien warriors for good.